[AUTO](VC):When this unit's drive check reveals a «Kagero» <Flame Dragon>, this unit gets [Power]+3000 until end of that battle. Wrapping up Promo Week is Flare Whip Dragon. (3 Kagero out of 5 cards, go figure.) 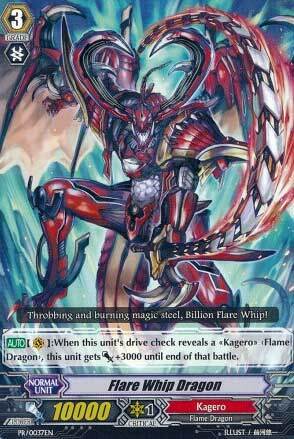 His ability is whenever you Drive Check a Flame Dragon-type Kagero, he gains 3000 power until the end of the turn. I guess he isn't horrible. With the right amount of Flame Dragons in the deck, he'll be swinging for 16k without a boost assuming no triggers. so you could easily pair him up with a 5k booster to swing for 21k. 8k+ if you don't feel so confident. I suppose there is no shame in using Flare Whip until you can afford the stuff to make your Kagero deck more focused since at least it lets you use your Grade 1s elsewhere, and he should be fairly cheap to get a-hold off. All in all, he's okay as a springboard for a more focused deck, but you will want to move on relatively quickly.